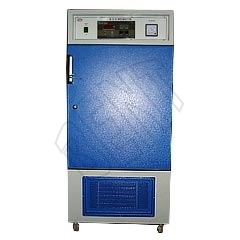 We manufacture B.O.D Incubator that is highly flexible and durable low temperature incubator. Our B.O.D. Incubator is utilized to prepare Biochemical Oxygen Demand determinations and for preservation of chemicals, vaccines, and many more. It is double walled with the inner chamber made of stainless steel and the outer made of mild steel which is duly powder coated. There is insulation between outer and inner chamber of 75mm size which is filled with premium quality glass wool. The entire body lies on caster wheels. It contains a double door chamber where the inner door is made of Perspex Transparent Sheet and the lock is provided on the outer door. The unit is also fitted with illuminated lamp inside the chamber. The temperature ranges from 5oC to 50oC with accuracy Â± 1oC. The unit is fitted with a digital temperature controller and an air circulating blower to keep the temperature uniform inside the chamber. These incubators come in different chamber sizes.